A major part of Horst Hoheisel artistic work is consecrated to what cannot be seen, to what once was visible but is not anymore. The intention is not to bring his work back from deepness and project it into the present, for this would be a mere consolation. Conversely, what matters in Hoheisel’s work is disappearance per se, that which gives density to the meaning and incurs in a memory effort by far worthier than the mere material permanence. The projected anti-monuments partially produced in Germany (many in collaboration with Andreas Knitz) constitute attempts to fix in memory the emotional link attributed to losses, Kassel’s inverted source stuck to the ground; the exact negative - the hollow – of a destroyed source; the forgotten heated plaque semi-hidden in Auschwitz lawn where once existed, for a short while, a precarious commemorative obelisk; the expiatory projected demolition of Brandenburg gate; and so on. 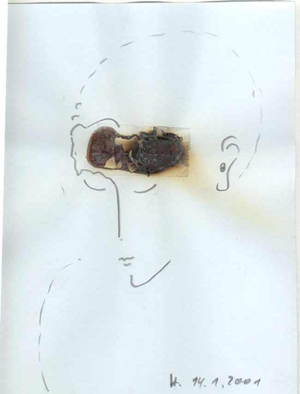 Horst Heisel sketches should be interpreted by means of disappearance and re memorization. Initially, their function used to be almost therapeutic: spots thrown on paper, every single day, before he would begin to work: remembrances - or their almost unintelligible shades; fragments of the previous-night-dreams; fugacious impressions impossible to draw clearly. Organized in note books or in big paper rolls, the sketches were dated one by one, apparently composing ramshackle series that actually relate to a motive impossible to identify by means of similarity, analogy or recurrence. Perhaps more than the note books, the rolls represent the perfect image of the relation each sketch maintains with the ensemble. Because rolls are big, it is impossible to completely unroll them. Only a portion can always be seen, a tiny segment of a more complex configuration whose major part always remains buried behind the two imposing cylinders encasing the paper. The cylinders themselves are a sign: objects as enigmatic as the sketches they carry. There are no traits of a style in Hoheisel’s sketches, much less those of a unique style. However, as the style per se consists in an act of memory, the memory of many styles can be found in them all: Romanticism, Symbolism, Expressionism. De Redon, Dix, Beuys. Beyond the shapes, images resemble to words in an unfinished narrative. The oil stick, whenever superposed to the graphite, functions either as an accentuating element or a smoothing one: it can emphasize a detail – willing to prevail along the narrative – or hide a trace, by making it merge into the indistinct midst. For instance, in a person’s face with closed eyes – asleep? – the skullcap may mingle with a mountain’s profile ( in this case, the white stick marks the rectilinear slopes over the curves of the brow). At the crown of the head, a “fleshy ouverture” amidst the hair discloses a golden mass resembling coins or nuggets. Two pages forward, or two days after, an almost shapeless face shows a golden brow. Then, turning the page, another dormant face – perhaps a self-portrait? – now almost completely white covered reminds the shape of the mountain in the previous sketch, but disjointed in multiple facets. Like a crystal, only the bright golden tonality remains, passing through the slit. There … lies a treasure, that … on occasion is visible and on others sinks and escapes. It is necessary to capture it, fix it and then … pass it on. We are all part of this half-words metaphoric story. Born in Pose, Germany, in 1944. While graduating in Forest Sciences, he also attended classes as an auditor student at the Academy of Arts, in Munich. Hoheisel promoted the ecological analysis of a tropical forest in Venezuela, at the Forest Engineering Institute for the study of the tropics, at Göttingen University, as a scientific assistant. While attending classes at the Kassel Academy of Arts, Hoheisel lived amidst a Yanomami Indian tribe at Orinoco, Amazon, Brazil, and also made several trips to the Sahara. For over twenty years, Horst Hoheisel was artistically devoted to the National Socialist Movement. Jointly with Andreas Knits, he elaborated and produced new shapes of monuments, which became internationally known as ‘negative-monuments’ or ‘counter-monuments’ (www.zermahlenegeschichte.de). Horst Hoheisel’ drawings are for the first time being exhibited in São Paulo, at the Lasar Segall Museum. Germany and the Holocaust have been transformed world widely into the paradigm of a Nation’s need to intensively take care of its own past. What is the meaning of memory for the future of our society? Which role does Art play in this context? No doubt Germans live in a post-traumatic society and, therefore, artists dedicate their work to heal the wounds of the past. Horst Hoheisel is one of the artists who devoted his attention to the past. Attending an invitation from Marcelo Araújo and Lorenzo Mammi, jointly with Andreas Knits, he did two projects for São Paulo City, referring to the Brazilian most recent painful wounds: at the Pinacoteca do Estado, the reconstruction of the entry portal as a birds cage of what used to be Tiradentes Prison; in a 1:1 proportion basis; and at Maria Antonia University Center, where vestiges of the old building – which still remits to the period when intellectuals there made a proof of the resistance against dictatorship – were restored. The country Hoheisel got to know is neither Brazil from Copacabana beaches, in Rio de Janeiro, nor from the Edifício Itália, in São Paulo City. He entered Brazil through the impenetrable Yanomami’s forest, the primitive country most of Brazilians do not know. As the ‘sharp end of the memory arrow’ his drawings, exhibited at the Lasar Segall Museum, make us conscious of the threatened world of the Yanomami tribes. Nonetheless, there is still room in Hoheisel’s drawings for his personal associations, for a connection to access his own world and, thanks to the sharp end of the arrow, a means to know Hoheisel, the artist. Originally, Hoheisel’s thousands drawings were not meant to be exhibited in a museum. 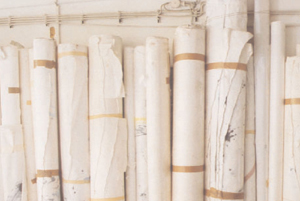 On the contrary, they are almost ‘un-displayable’: the inaccessible artistic journal unfolded by means of huge paper rolls, the ‘rolls-role’ of memory.